We have been fortunate over the years to have customers from all over the world, buying our products for many different uses. Even so, we were still a little bit (happily) surprised when we were contacted via email by the manager of an ultra-deep-water mobile offshore drilling unit operating in Ghana, looking for bunk curtains and tracks. Luckily, we have provided tracks and curtains in these kinds of work environments before, so we were able to quickly get to work in figuring out exactly how to meet his needs. The drilling rig had 45 units in need of privacy bunk curtains for a third bunk, which needed to be custom made to allow for the unique dimensions of the quarters, and, as our client said “This is the offshore oil environment - it must stand up to severe abuse.” We knew right away he would need our Eclipse fabric curtains. 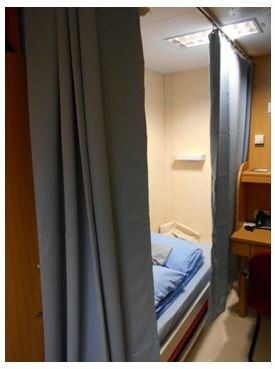 These curtains block 98% of light, are commonly used in bunks and berths, and they are tough enough to stand up to the rig’s environment: They have a triple thick 1.5 inch header reinforced with a middle layer of nylon mesh, Safe-T stitching in the hems and seams, and the grommets are two-piece rustproof nickel-plated brass. The fact that they are machine washable and flame retardant is just icing on the (very tough) cake. The client opted to install the 88001 Privacy Cubicle Curtain Track, which is a good choice for this use. This aluminum track is available in six, eight, twelve, and sixteen-foot sections, can be spliced together if needed, and can hold a load of 2.5 lbs per foot. We worked out the specifications and colors through a series of email exchanges (the client is four time zones ahead of us! ), and sent one track and curtain for the manager to install as a test (pictured). He was happy with the result, and has ordered enough bunk curtains to outfit the rest of his units. We would love to help you with your work environment needs. Give us a call at 888-434-7444 to talk with our knowledgeable sales staff.